A study conducted by researchers on East African highland bananas showed that the moderate use of mineral fertilizers could double the production of the crop, improving the lives of over 70 million people who depend on the crop for their food and income. However, the research also found that very few of the banana growers use fertilizers, missing out on the opportunity to maximize their crop’s food and income potential. A USAID-funded study carried out by the International Institute of Tropical Agriculture (IITA) in nearly 200 farmer fields in Uganda - the second largest producer and consumer of bananas in the world - showed that modest fertilizer use can significantly increase the crop’s yield. For example, yields doubled from 10 to 20 tonnes per hectare per year in Central Uganda with modest fertilizer application. The study, led by Dr Piet van Asten, IITA agronomist based in Uganda, and Lydia Wairegi, a PhD student at Makere University, also found that less than 5 percent of the farmers ever used fertilizer on their banana crop. “The application of fertilizers not only increases bunch weight but also shortens the crop cycle so the plants produce more bunches in a year,” says van Asten. The farmers surveyed in the study said that they do not use fertilizers because they are expensive, supply is lacking, and that they are not available in small, convenient and affordable packs. They also cited the lack of access to credit facilities, limited knowledge on fertilizer use, and misinformation about fertilizers’ negative effect on soil quality and on the taste of the bananas. 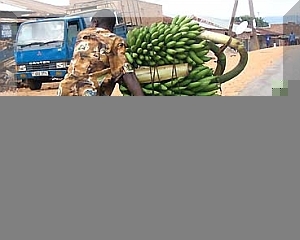 A related farmer sensory evaluation carried out by IITA and Uganda’s National Agricultural Research Organization (NARO) showed that fertilizer use not only increased yields, but also improved the quality of banana for making matooke, a popular local delicacy made from steamed bananas. According to the evaluation, fertilizer treatment actually improved the appearance, odor, texture, and overall acceptability of the steamed bananas. However, van Asten cautions that fertilizer use has to be very strategic. For example, fertilizer use becomes more profitable when it is specific to a crop and a region, and specifically targeted at only those nutrients that are most deficient. “Most farmers follow blanket fertilizer recommendations which can be very inefficient and therefore expensive. Farmers should apply only as much nutrient as is needed for a realistic yield increase for their location,” he says. He adds that another consideration is distance to the markets. “Bananas are perishable and costly to transport because of their bulkiness. One needs to be close to the market to fetch a really good price,” he says. “Some of Uganda’s production zones are too far from markets, more than 150 kilometers away. This leads to low banana prices at the farm gate. Fertilizer use in such cases becomes risky and may therefore not be recommended,” adds Asten. Fertilizer usage also helps replace lost soil nutrients. For example, the study estimated that more than 1.5 million tons of potassium (K) are removed from the rural areas where the bananas are grown and transported to Kampala where most of the markets are. These nutrients are mined by farmers, but not immediately replaced. To guide highland banana farmers, IITA and its partners have developed several site-specific recommendations for the application of fertilizer based on the region and the distance to markets. The institute is also encouraging the private, public, and non-government sectors to address fertilizer packaging to suit the specific needs of farmers.